Before you get caught up in the stress that comes along with the holiday season, stop whatever it is you’re doing and reflect on what the holidays are really about. It’s about being with the ones you love and being selfless. Christmas isn’t all about gifts and who got the most money from grandma and grandpa; it’s about appreciating having a family who you can celebrate these holidays with. To give you an idea as to why we should learn to love the little things in our lives this Christmas holiday, take a look at these priceless pictures. 1. This pooch wrapped up in lights. 2. A sweet little angel admiring the first Christmas flurries. 3. Santa walking home from a long day of listening to little kiddies wishes. 4. The perfection and uniqueness of the smallest snowflake. 5. 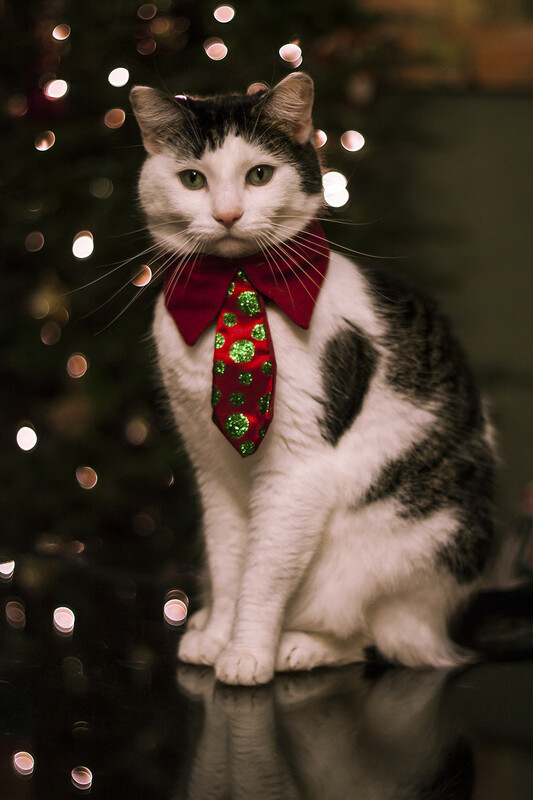 This little guy who got all dressed up for his Christmas Friskies dinner. 6. This stunning little snow angel. 7. The cat that found out the hard way he doesn’t like snow…priceless. And finally the, “Please, help me!” face. 8. An adorable little cherub holding a handful of snow. 9. This little guy who tried to stay awake for Santa but failed in the cutest way possible. 10. This kitten that wants all the jingle balls. 11. The friendliest of snowmen. 12. This kitten that desperately needs your help opening his new toy from Santa. 13. Eyes of a child full of Christmas wonder. 14. Even though Grumpy cat says, “Ho, Ho, NO…” he’s still adorable in his red little sleigh. 15. Santa making sure to visit our loved ones overseas. 16. And finally, this duo who just wants a few sips and a couple bites before Santa comes. During the hustle and bustle of this holiday season, take a moment to step back and really soak in the little details. Remember the smell of the pine tree in the living room and the warm apple cider sitting on stove. Remember all your loved ones sitting around the dinner table sharing old memories and making new ones. This Christmas, be thankful, for everything you have in your life, because many people are happier with much less.